We will soon be introducing a new scaled down version of our Isle of Lewis Chess Pieces. The original laser scanned replicas from National Museums Scotland feature a King at 3-1/4″ high and a substantial base diameter of 2″. By virtue of the large bases of the chess pieces a large chess board is required – usually close to 22″ with a square size of at least 2-1/4″. While the size of this set reflects the size of the original pieces discovered in 1831, some find the set too large for their home setting. The New Mid Sized Isle of Lewis Chess Pieces feature a King at 2-3/4″ high with a base of 1-5/8 inches. 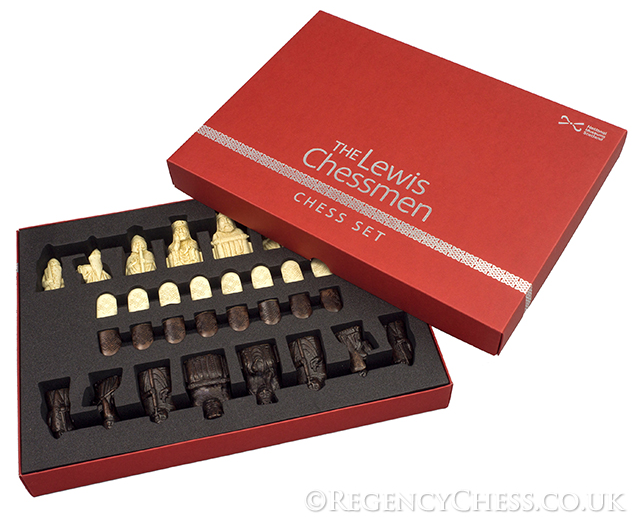 A chess board around 17″ is perfect for these pieces. We will soon have the pieces and several board combinations up on our site.